The great Roman and Byzantine city of Lower Galilee. A capital city and major Jewish center during the Byzantine period. Sepphoris (Zippori, or "birdy") was a major Roman and Byzantine city, the capital and heart of the Galilee province. It included a network of colonnaded paved streets, markets, residential houses, public buildings, bathhouses, theater, synagogues and churches. The richness of its mosaic floors (expanded in another web page), architecture and other findings indicate that the city was wealthy. It was a major Jewish town at the Byzantine times, and for some time the center of the Jewish administration in the Holy Land. 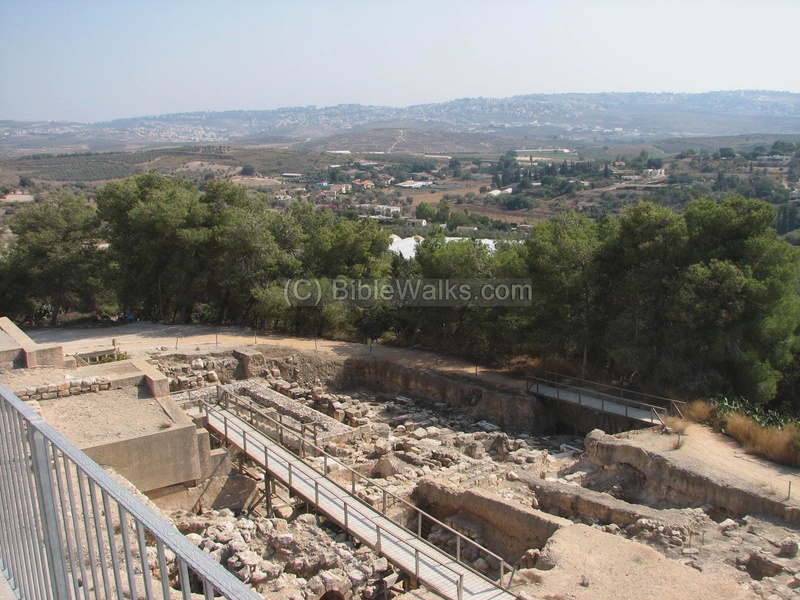 The ruins of the ancient city are located in the western Lower Galilee, 5KM north-west to the old city of Nazareth. The ruins of the ancient city is located on the top and sides of a hill (289M above sea level). 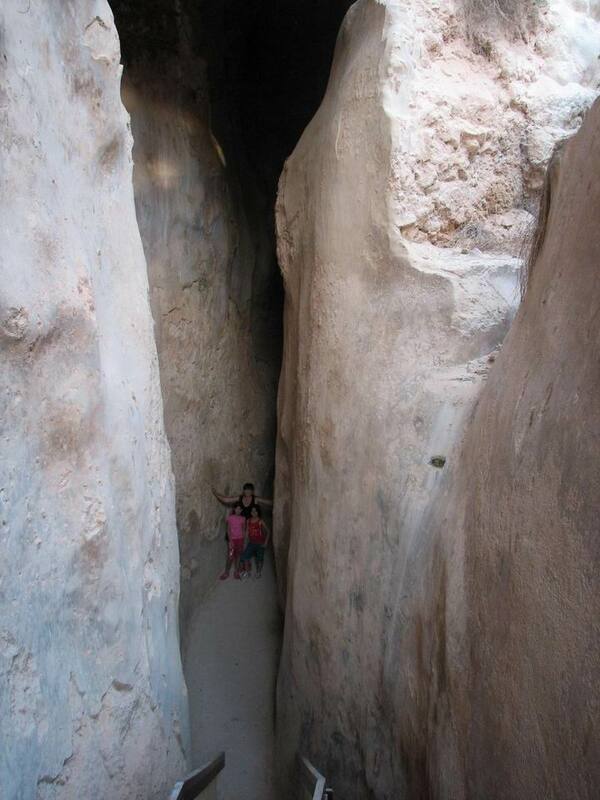 The site is accessed from the main road from Acre to Nazareth, through the modern Moshav of Zippori. According to some scholars, the city (identified as Kitron or Kattah) was part of the region of the tribe of Zebulun, but was not captured. 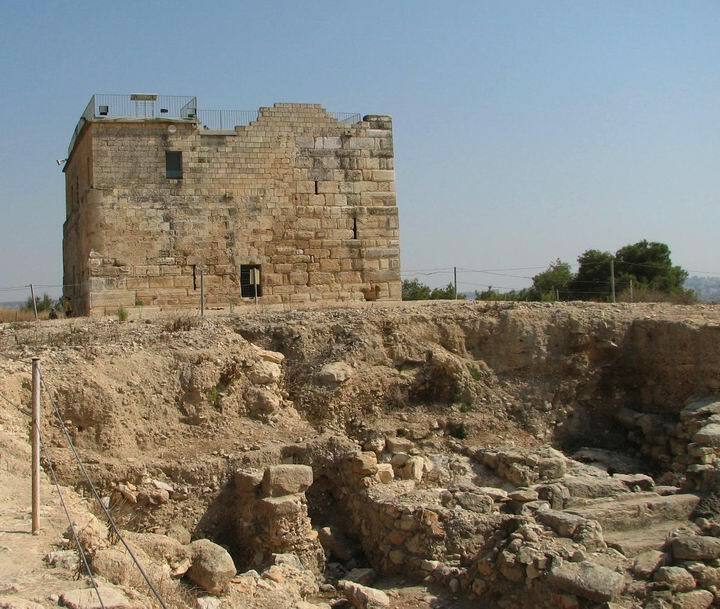 The Mishna tells us it was fortified by a wall during the Israelite conquest. The excavations unearthed findings from the first temple period. The city started to grow during the 2nd C BC and was one of the cities ruled by the Hasmonai King Alexander Janaeus. In 55BC, 8 years after conquered by the Romans, the city was declared as the capital of the Galilee. 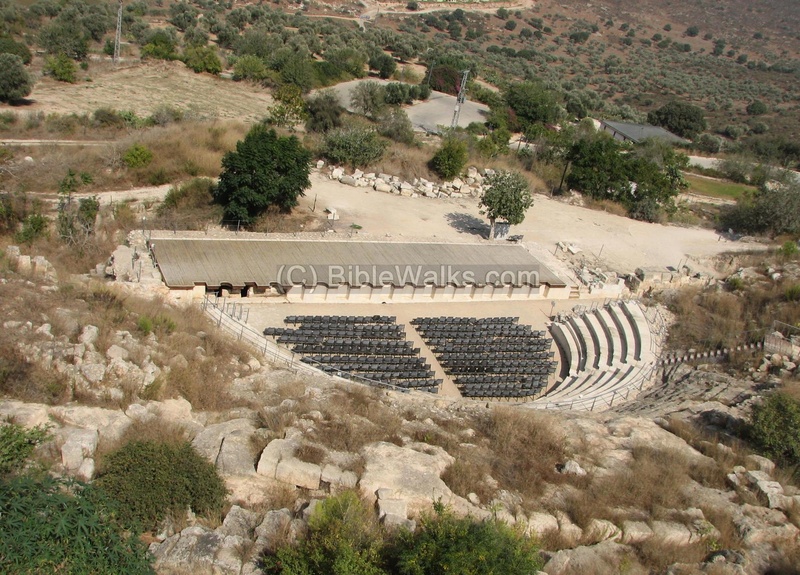 In 47BC Herod the Great conquered the city and made it his Galilean capital. After Herod's death in 4BC the Jewish citizens seized the city but the Romans under Verus re-conquered the city, burnt it and sold the Jewish rebels to slavery. Herod's son, Herod Antipas, rebuilt and fortified the city. The city is not mentioned in the acts and events of Jesus, but he probably has visited the city, which is in the near proximity of his childhood village of Nazareth. The city was a commercial center for the whole area and he may have received work as a carpenter. The city spared the destruction during the Great Jewish revolt against the Romans since it refused to take part in the revolt; it surrendered and opened its gates (66AD). This angered the fellow rebelling Galileans, since instead to lead the revolt this central city decided to save itself. After the 2nd Jewish revolt (Bar-Kochva 132-135 AD) the city transferred changed its name to Deocaesarea (=city of Zeus and Caesar) and was ruled by pagans until the 3rd C. It is unknown what was their stand or fate in this revolt, but it caused the change of the city's leadership for almost 200 years. The Romans built a number of important Roman roads that connected the city with the major cities in the Galilee: two roads to the port city of Acre (through Usha and through Hannathon); a road via Shimron and Kibbutz Yifat to Legio (Megiddo), their military HQ in the Galilee; and the road through Golani junction to Tiberias, which was a major sister city at these times. This made the city more accessible, made the city a center of trade for the whole area, and enabled the Romans to control the Country better and move their forces faster in case of yet another revolt. During the early 2nd Century AD the city was rebuilt and expanded in a grand Roman plan, as attested by the impressive network of streets (Cardo, Decumanus), public and residential buildings, water works and Theater. The city was wealthy and beautiful, the jewel of the Galilee. 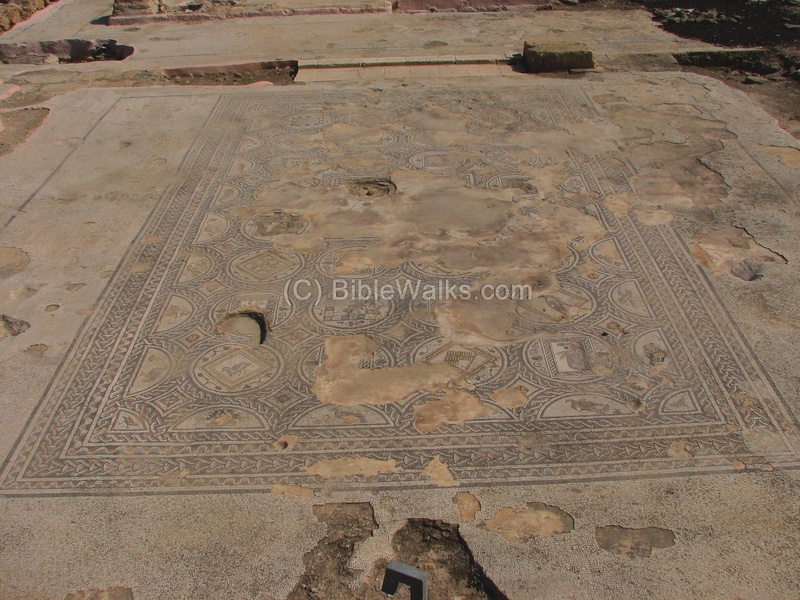 Later, at the beginning of the 3rd Century, Sepphoris/Zippori was Jewish ruled once more, and became for some time the seat of the Jewish administration (Sanhedrin). The Mishna, a 2nd C AD books of Jewish practices, was compiled at about 200AD by Yehuda Hannasi, the head of the Sanhedrin and a resident of the city for 17 years. 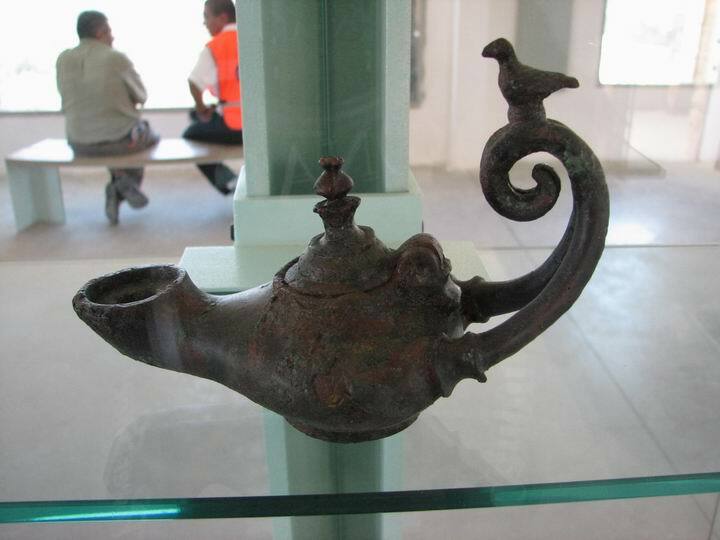 This is a major contribution of Sepphoris and made it famous throughout the Jewish world. Yehuda Hannaasi is buried in Beit Shearim, but his grandson (with the same name) is buried in a grand tomb in the ancient cemetery on the west side of the city. The city continue to prosper. During the time of Constantine the Great, who adapted Christianity as the Roman's religion, a church was first built in Sepphoris. A number of other churches were built in the Byzantine period, although the majority of its citizens were Jewish. A total of 18 synagogues were referred by Talmudic sources. In 351 a major rebellion against the Romans was suppressed, but the Romans spared the city once again. However, the city was heavily damaged by nature - a major earthquake (363 AD) hit most of the cities in the Galilee and Israel. It was rebuilt and continued to flourish until the decline in the Arab period (7th C). The Crusaders rebuilt sections of the city and the fortress, calling it Le Saphorie, preserving the ancient name. On the west side of the hill they built a church, honoring Mary mother of Jesus, who according to tradition was born here to her parents Joachim (a scribe) and Anna (parts of the church still stands there today). The Crusaders held a major force in the city and used it as a base of their battles with the Arabs. From Le Saphorie the Crusaders armies dispatched their forces to the help of Tiberias against Saladin's Arab forces on the night of July 2, 1187. On the way to Tiberias they were defeated in the battle of Hittim, which signaled the starting of the end of the Crusaders in the Holy Land. The Arab town of Suppheriyya preserved the ancient name and existed from the Crusaders times until 1948. In the 18th C, during the Ottoman period, a Bedouin called Daher El-Omar, restored the fortress in 1745 and incorporated some of the ancient stones and sarcophagus that he collected from the ruins. The city was first excavated in 1931, and major excavations were conducted during 1983-2003. A Moshav was established here in 1949 and preserved the ancient name Zippori. It is located south and south-west to the ruins. Today the ancient site is a National park, a recommended archaeological site. 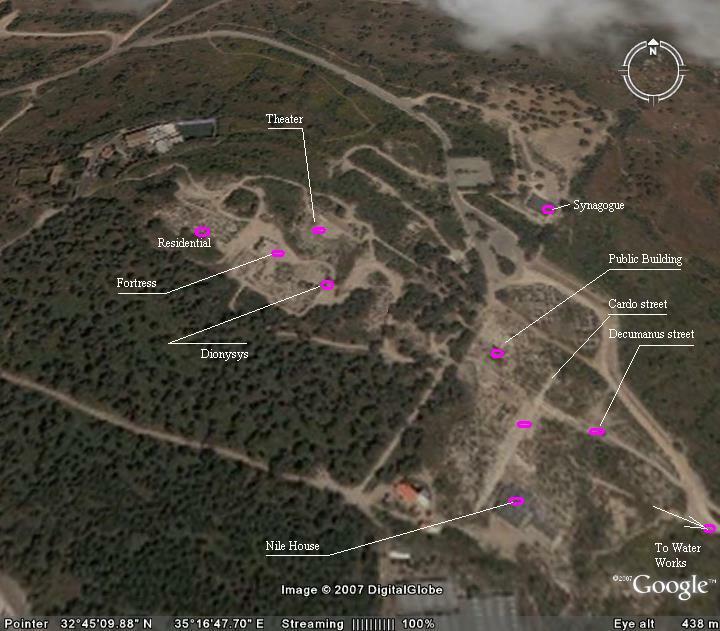 The following aerial view shows the points of interest and a map of the area. You can point on the purple points to navigate to the selected point. All photos by Tuvia Liran. The entrance to the archaeological park is through the Decumanus (the principle gate street in Roman camps and cities), an east to west Roman street dated to the early 2nd C AD and part of the network of streets. 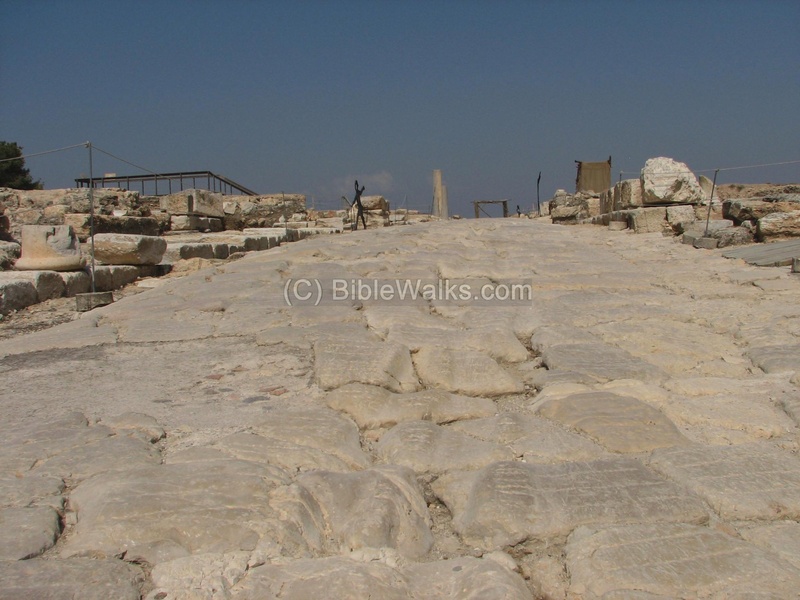 The stone paved streets were carefully designed and arranged in a grid, typical of the newly constructed major cities in the Roman world (for example: Cardo Maximus is Jerusalem). They were colonnaded and led to entrances of the buildings on both sides of the streets. The Decumanus street crosses the Cardo (Latin: line) - the main road of the city, which runs north to south. On the paved limestone blocks there are signs of the grooves left by the wagons. Columns along both sides of the grand street created roofed porticoes (entrances to the buildings and small shops) and were paved with mosaics. The shops along the street formed the "lower market". One of the stones has an engraving of a seven-branched candelabrum, a Jewish symbol. In the photo below, taken on the south-east side of the Cardo, you can see the mosaics that are located on the portico side of the colonnaded street, with an inscription on the left side. On both sides of the street are small shops and beyond them many residential houses. On the south side of the city, and east to the Cardo, is a large building called the "Nile house" - named after one of its amazing mosaics that depicted scenes from the Nile, seen in the photo below. The mosaics are detailed in a separate web page. A large public building (40 x 60M) is located on the north side of the intersection of the Cardo and Decumanus streets. It may have been the city's market (agora). According to the Talmud , there were two major markets: in lower Zippori (maybe this building) and in upper Zippori (up the hill). The center is a courtyard with colorful mosaics with geometric patterns and animals, as seen below. In the center of the city, high above the site, is a fortress. It was initially built in the 3rd C AD, then rebuilt as a 2 story fortress by the Crusaders who incorporated large stones collected from the Roman ruins, such as sarcophagi that were used as cornerstones. The fortress was repaired in 1745 by Daher El-Omar. Today the fortress is used as a museum of the archaeological findings. On the south-east side of the fortress is another residential area in excavation. In the photo below is the view from the fortress that is located on the highest point in the city. Behind the trees are the houses of Modern Moshav Zippori, and beyond it in the far background is the modern city of Nazareth. The old city of Jesus is on the right side of the city. Another residential area is seen west of the fortress. These are dwellings from the Hellenistic to Byzantine periods. A 1st C building with massive walls had two built-in ritual baths. Many houses had underground storage areas, cisterns and ritual Jewish baths. In the background is a building that is part of the Sepphoris Monastery, the location of the 12th C Crusaders church and two ancient Synagogues. In the right background is the lake of the National carrier project, and behind it is Tell Hannathon. 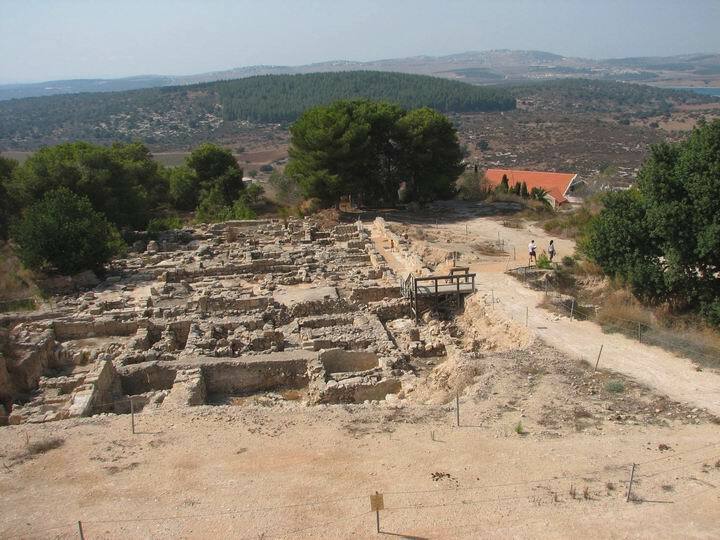 This Dionysus building is located at the top of the hill, east of the fortress. The mansion was built in the 3rd C and destroyed at the earthquake of 363 C AD which affected the Galilee and other parts of Israel. 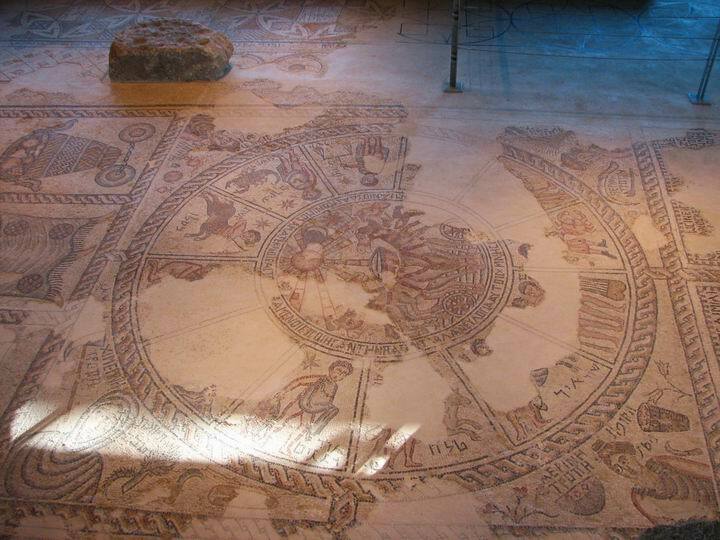 The rooms in this Roman villa was richly decorated with colorful mosaic floors, many of them with mythological scenes related to Dionysus (God of wine). 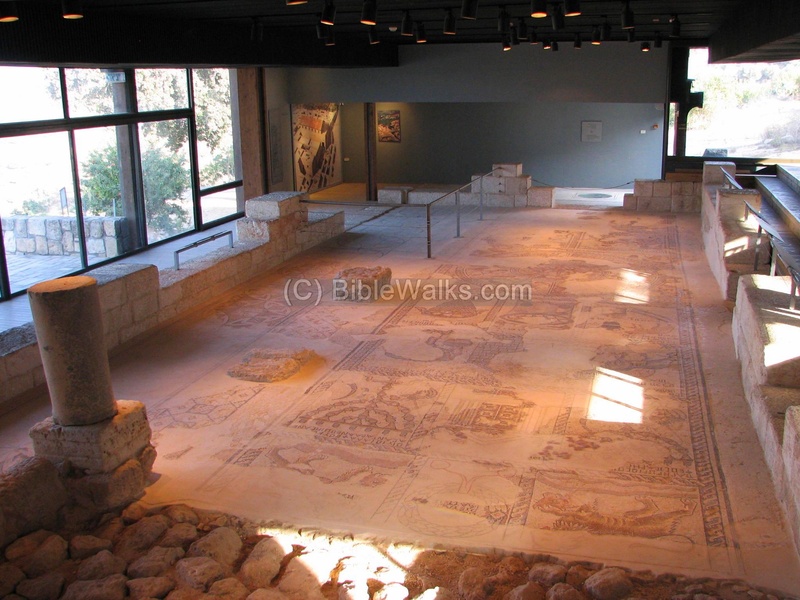 One of the famous findings in Zippori is the "Mona Lisa of the Galilee", that was discovered in the banquet hall. 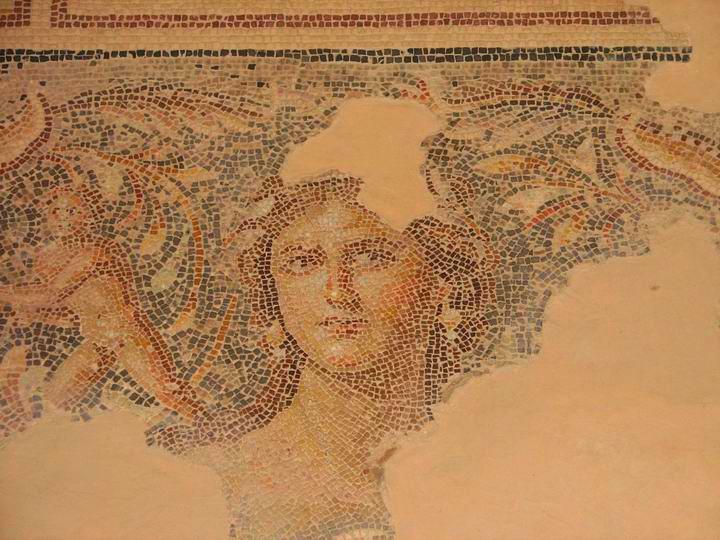 The mosaic, shown below, is located in the central panel and portraits a beautiful woman - probably an illustration of the Roman Goddess Venus. Zippori had several synagogues (18 according to Talmudic sources), but so far only this one was unearthed in the North side of Zippori. Dated to the 5th C, the 15M x &M building was covered by a magnificent Zodiac mosaic floor, 20 inscriptions in Greek and Aramaic, and scenes from Bible stories. 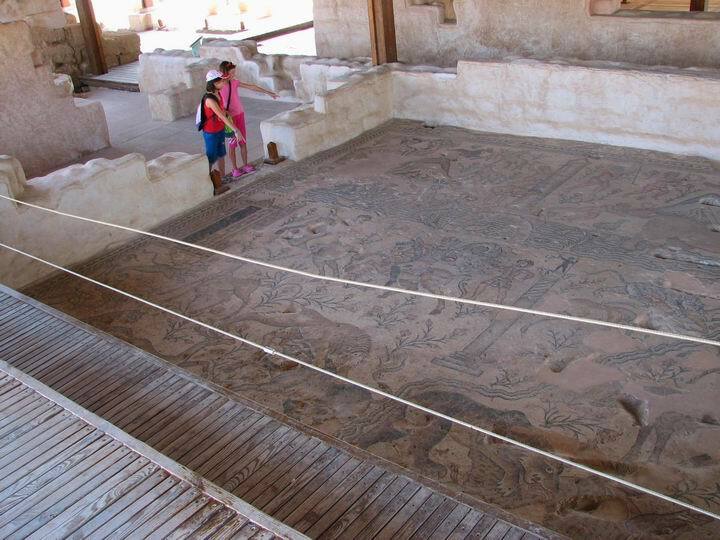 The Zodiac mosaic floor is seen below. The Roman theater is located north to the fortress. 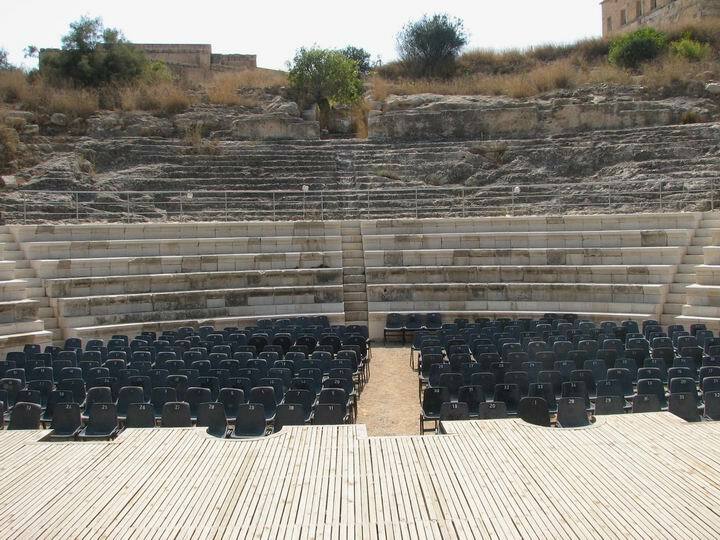 It was built in the beginning of the 2nd C AD and contained 4,500 seats. The size of the theater is 70M wide. The center stage had a stone base with a wooden platform above it. The theater had 5 entrances, three of them pass through the rows of the seats (seen below) and two on both sides of the stage. The theater served the pagan residents of the city since the Jewish citizens avoided the plays that were performed in the theater. Near the entrance to the National park, and 1.5KM east from the city, is a large ancient water reservoir. Its size is 260M by 10M high and 2-4M wide, holding a capacity of 4,300 cubic meters of water. The water came from 2 long aqueducts, with a total length of 13.5KM, bringing water from the area near the villages of E-Reina and Mashad. The water system included valves, vertical shafts and support arches. This enormous project was built in two phases - the 2nd C AD and the 4th C AD, and served the city until the 7th C. It provided water to the major part of the city, while the higher places around the fortress used cisterns for their water supply. 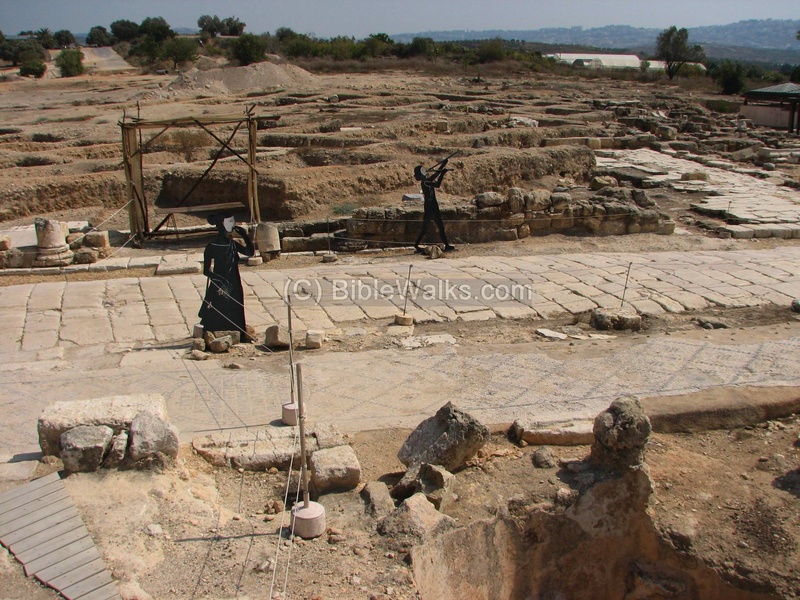 Villnai identifies "Kitron" as the Biblical town of Sepphoris. The Israelites, within the region of the tribe of Zebulun, failed to capture it but collected taxes. "Neither did Zebulun drive out the inhabitants of Kitron, nor the inhabitants of Nahalol; but the Canaanites dwelt among them, and became tributaries". 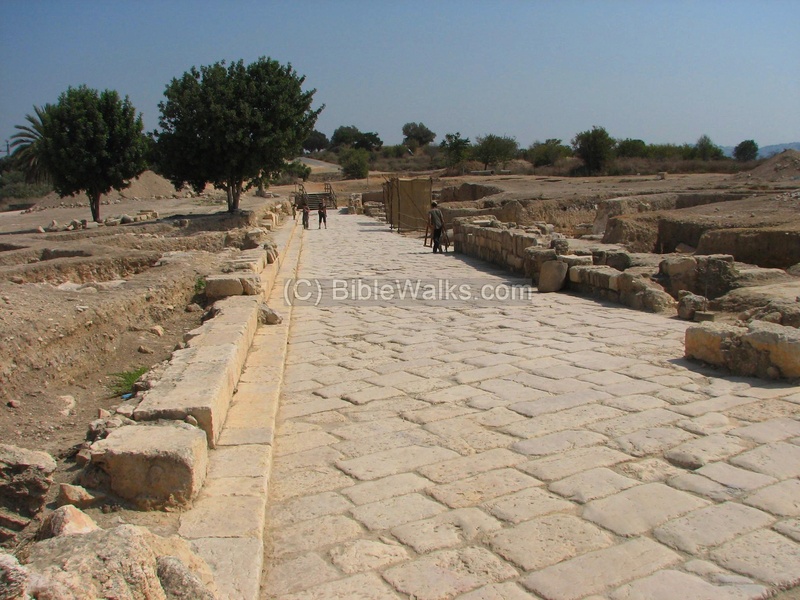 This city may have been also called "Kattath", part of the Zebulun tribe's region. "... And Kattath, and Nahallal, and Shimron, and Idalah, and Bethlehem: twelve cities with their villages. This is the inheritance of the children of Zebulun according to their families, these cities with their villages.". "...Houses surrounded by walls from the times of Joshua Ben Nun such as the old city of Zippori..."
The historian Josephus Flavius, the commander of the Jewish revolt, writes about the city in many references. Zippori - In Hebrew, the name "Zippor" means bird. Why bird? According to the Babylonian Talmud the "bird" came from its looks - "like a bird on the hill" (Babylonian scroll 6). Sepphoris - the Roman name, based on the Jewish name. This name appears on a Roman coin. Autokratoris - In Greek: autonomous city; the name of the city at the times of Herod-Antipas. Josephus writes about this (Ant 18,2 ,1). Le Saphorie - the name of the Crusaders city, preserving the ancient name. Decumanus: Latin for "tenth". It was the principle gate street in Roman camps and cities, and called such since the Romans placed 1/10th of a Legion along the entrance.